Instagram is one of those photo sharing apps that has caught a wild cult following of just about every smartphone user. Instagram's powerful array of enhancing filters make your already good looking photos look all the more picturesque. Some turn out so great that they're worthy of being proudly displayed on your wall for ever to be admired. It's just so happens that CavasPop is here to help you put your best digital Instagrams on canvas using its effortless print service. CanvasPop's PicturePerfect technology promises your full-out filtered Instagram photos to look crisp without pixelation on canvas even if you're using a low-resolution image. We've gone ahead and put CanvasPop's claim to fame to the test in our in-depth hands-on! Turning your Instagram photos into wall art is as quick and easy as 1-2-3. The process isn't done thru your smartphone or the Instagram app, but instead done straight thru the CanvasPop Instagram page. You have the option to choose from two canvas sizes, a small 12"x12" square canvas at $40 - or the larger 20"x20" square canvas at $114 which is the one we're reviewing here. The 20"x20" canvas print is definitely expensive for its size, and it isn't going to fill a large, blank wall very well obviously. The much smaller 12"x12" canvas size is suitable for comprising multiple extension that make up a larger and creative wall art pattern or to be hung on a small piece of wall space so that it doesn't look ridiculous out of place. It's up to you and your budget of course. CanvasPop prints your Instagram photos on 20x20 perfectly squared thick, frameless canvas with real solid wood internal frame base, and then ships it to you inside a well protected cardboard packaging. To actually pick your photo, CanvasPop has integrated an Instagram browser where you can sign-into your account, pick the photo you want to print and CanvasPop does all the rest for you. The process is also similar when using CanvasPop's most recent Facebook print service. CanvasPop also compensates for the lack of filters with a few options of its own for you to pick from should you choose to enhance your photo. CanvasPop also lets you pick a white or black border at no additional cost. The canvas frame is 1.5" deep and gives a really nice depth to your picture when hung on the wall, like a gallery art. The original photo that I shot of some outrageously good beer bottles (please shoot responsibly) and used for my canvas print had some type of Instagram filter on it as well as a sharpening filter that I've applied prior using Camera+ with the addition of another blurred filter. It definitely has a lot of noise and grain when viewed full size compared to the RAW and unedited version straight from the iPhone 4S, so I was keen to find out how CanvasPop handles it. Regardless, when picking that photo you must make sure that you haven't gone overboard with the saturation sliders and doubling or even tripling filters which will result in a noisy, unclear and just a bad quality image when blown up on print. The final result is absolutely amazing. It's unbelievable that even though the image has been cropped to fit dead center resulting in roughly 20% of the surrounding area has been cut off, the image quality has retained its sharpness and clarity really well. And I believe that has a lot to do with CanvasPop's brilliant PicturePerfect enhancement. There's absolutely no jagged edges or pixelated corners to be found as promised. The canvas texture can be seen very subtly thru the printed color when viewed up close and finished with a matte laminate coating for added durability. The image on canvas looks nearly identical to that of the digital file I sent CanvasPop to print. The contrast and vivid colors are all down on canvas, it looks magnificent to say the least. The only downside I could find is that you cannot go bigger than 20"x20" size using this Instargam process, unfortunately. But that of course makes proper sense with the limitation of megapixels. You're not limited to Instagram and Facebook alone, you can go much bigger if you'd like to print any of your original artwork, graphic and enormous DSLR photos using CanvasPop's original canvas printing service that lets you pick various sizes and canvas shapes. And the more pixels you've got, the bigger you can go. The quality doesn't stop with the printing quality. What insures the canvas is stretched tightly and kept that way for years to come is a thick, rigid wood frame that's as solid as a rock, and supports the stretched canvas which is stapled down using more than enough staples. The canvas itself is also of high quality and impressively thicker than most average canvas prints that I've seen and also have all around the house. The corners of the picture frame look tightly stretched back and pointy without any loose or excess canvas. Lastly there's one metal saw tooth hanger around the back of the frame that's already pre-installed so the canvas print is ready to hang right out of the box. 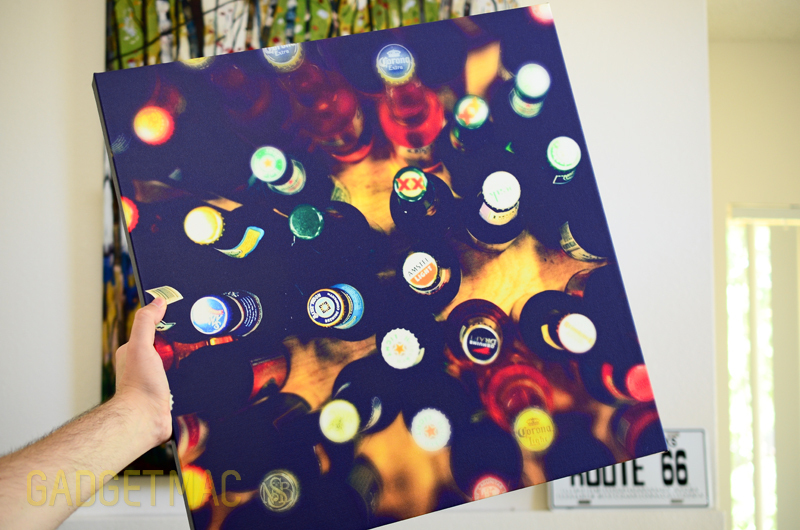 The overall quality you get with a CanvasPop canvas print is really up there with some of the best. It by far has the best internal wood frame structuring that's full of depth that literally pops out on the wall (pun intended), and a thicker canvas than most ordinary canvas pictures at the same if not higher price range. If you're looking to put that amazing photo you took on the wall, look no further than CanvasPop. We would highly recommend going big unless you plan on being a tad more creative with the smaller sized canvas to create something modern and unique. CanvasPop's 20"x20" canvas print is on the pricy side at $114, so you better make it count.